Deep in Ontario’s north sits the Ring of Fire, an as-yet undeveloped cluster of mineral claims worth an estimated $60 billion—but only if you’re being conservative. Some industry experts, including James Franklin, former chief geologist with the Geological Survey of Canada, believe an additional $140–$190 billion in economic value exists there from gold deposits alone. For a region with little economy to speak of, the potential for multi-generational mineral riches has been deemed a godsend. Many in the province have called it Ontario’s oilsands, and meant it as a compliment. Others have dubbed it the new Klondike, a reference to its hoped-for ability to shape the region. In truth, the Ring of Fire has the potential to be the single largest mineral deposit in Canadian history, and could far outstrip the economic and social impact of both iconic Canadian developments. Yet, the region is also home to many other things besides precious metal buried miles underground. Tucked into the northern boreal forest, the Ring of Fire is primarily First Nations land, full of bogs and fens, roaming caribou herds, stunted tamarack and black spruce trees, all of it growing among thousands of shallow rivers and lakes dotting the landscape. This is the North, and the North is not a quiet place. As Ontario’s headlong rush to develop the Ring of Fire begins now in earnest, it’s about to get louder—just not in the way many might assume. This time, the region’s First Nations leaders don’t want to halt development: They want to make sure they get their share. To say the Ring of Fire is off the beaten path is an understatement. While the area is home to more than 4,300 on-reserve First Nations residents in nine communities, it doesn’t exist on any map you’ll find save for specialty mining documents. The closest towns and cities are strung out along the concrete ribbon of the Trans-Canada Highway running east-west along the north shore of Lake Superior. Smaller roads branch out in all directions, but even these routes have to end, often well short of remote First Nations communities dependent on winter roads or small aircraft to get in or out. Instead, you’ll find the Ring of Fire roughly 500 kilometres north-east of Thunder Bay—5,120 square kilometres of northern Ontario’s 450,000 square kilometres of peat, wetlands, and forest. The Ring of Fire is half-way between DeBeer’s Victor diamond mine and Goldcorp’s Musselwhite gold mine, with no way to get miners and equipment in, or valuable resources out. With few other economic options, mining casts a long shadow in this part of the province, and not all of the history is pleasant. First Nations blockaded the ice road leading to the Victor mine numerous times in early 2013, for instance, because they felt tricked by the impact benefit agreement they signed with the company in 2005. The mine began construction in February 2006 has been in production since summer 2008. Still, few expected the Ring of Fire region to be such a bonanza. After a small group of geologists and junior mining company executives came across small nickel and copper deposits in 2002, further exploration would slowly begin to unveil the expanse of mineral wealth in the region: chromite, nickel, copper, platinum, zinc, gold, and vanadium metals. Rumour has it an employee of one of those early companies noticed the minerals formed a crescent shape—but not quite a full ring—and, being a Johnny Cash fan, choose the nickname “Ring of Fire” after the Man in Black’s 1963 song. Today, in terms of economic potential, the Ring of Fire discovery ranks second only to deposits found around Sudbury in the late 19th and early 20th centuries. Currently, more than 20 companies hold about 9,000 claims in the Ring of Fire area. It seems almost certain the Ring of Fire will be developed—even its most vocal critics want development slowed to allow for further study, rather than halted completely. The big question is: When? And, perhaps more importantly: Who will profit? The answers depend largely on infrastructure capacities; northern Ontario’s lack of roads, bridges, schools, and other key resources is staggering. Until recently, the company most likely to help push such huge infrastructure development was Cleveland-based mining giant Cliffs Natural Resources. A few years ago, Cliffs began touting the benefits of an all-weather, north-south road over the competing rail transportation plan of joint venture partner, KWG Resources Inc. The road would connect Cliffs proposed drill site and camp at the Black Thor deposit to Nakina, a town to the south, near the Aroland First Nation. The Ontario government supported the proposal in principle, and the company hinted it expected provincial taxpayers to heavily subsidize road costs because of the purported benefits for local First Nations, including construction and operations jobs and improved access in and out of communities. Investment hinged on First Nations involvement in specific aspects of resource development—any community building that happened along the way would be a bonus. While Cliffs never stated publicly what it hoped taxpayers would cough up, rumour was Ontario may be on the hook for at least $700 million. Years of wrangling with rival companies over what projects in the Ring should be developed— and how—have taken their toll. On November 20, 2013, Cliffs announced it would “indefinitely” suspend all its development in the Ring of Fire, blaming “risks associated with the development of necessary infrastructure.” The company won’t sell its stakes in the region’s big deposits, or even leave the Ring of Fire, said a Cliffs spokesperson, but will halt the flow of exploration money while it waits to see what shakes out from talks between the government, First Nations, and other mining companies over how to develop the area. In the meantime, Cliffs’ plan to build a $1.8 billion chromite processing facility near Sudbury as part of its larger $3.3 billion mine investment, along with the promise of creating hundreds of post-recession jobs, seems to have disappeared overnight. 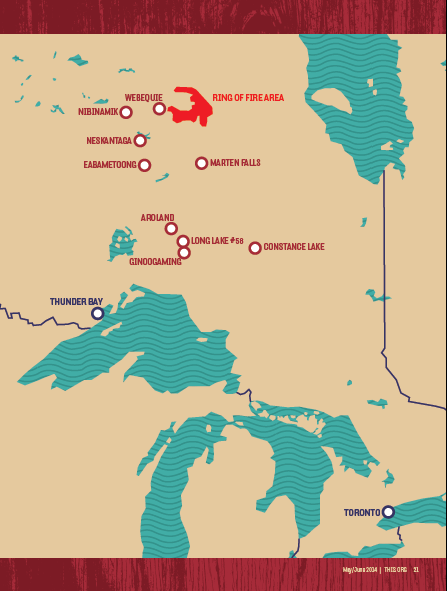 It’s a heavy blow to the Ontario government, which has long held Cliffs’ interest in the Ring of Fire as an example of the region’s potential and the government’s ability to attract investment from global companies. In the beginning, no one bothered asking any of the nine Matawa First Nations what they wanted out of the resource push in the Ring of Fire. This is nothing new, even though the duty-to-consult concept has been enshrined in Sec. 35 of the Canadian Constitution since 1982. Thinking back to Sudbury’s last mining boom, for instance, “No one ever thought to reach out to all the many First Nations communities,” says Sudol. For many, the Ring of Fire is a second chance to do things right—to guarantee First Nations benefit from development in their backyards. This is one of the primary reasons the Matawa First Nations Management Inc., a partnership between the nine Ojibway and Cree communities, was formed in 1988. Primarily invested in the well-being of their member communities—including economic development, health and education, financial advising and non-profit housing—the community representatives who sit on the board of directors realized the scope of the Ring of Fire could transform their traditional territory (not necessarily for the better) unless they got involved. On March 6, 2013, the Matawa chiefs held their first meeting with a sitting Ontario Premier since 1975. By the end, newly minted Premier Kathleen Wynne had agreed to negotiate a framework agreement that would govern any future development in the area. Ontario New Democratic Party Premier and former interim federal Liberal leader Bob Rae became Matawa’s chief negotiator. Not everybody in the Matawa has been equally enthusiastic about the so-called “opening up” of the area governed by Treaty 9, signed in 1905-06 with the Crown. The “for” and “against” camps are typically divided into those older or younger than 50, says Matawa CEO David Paul Achneepineskum. People in the older age bracket are primarily concerned with the health of their land, lakes, and rivers and are keen to keep them pollution-free, he says. Hunting, fishing and trapping are very much the way of life, and any resource extraction project could threaten that livelihood. But the opinion of those under 50 tells a different story, according to Achneepineskum. This cohort of young aboriginals, the fastest growing demographic in Canada, are faced with incredibly high unemployment rates: In 2011, Canadian off-reserve aboriginals between the ages of 35-54 had unemployment rates as high as 14 percent—and the number is significantly higher for those aged 24 and under, plus higher still for those living on-reserve. Development means the construction of all-weather access roads or rail linking the now fly-in communities with southern towns and beyond. Nobody denies the possibility of negative consequences: things like increased access to drugs and population drain to the south. But these things things can be minimized—with resource revenue more jobs and social services can be created in-community—and for many the risk is deemed worth it. To date, mining companies with a presence in the Ring of Fire have had mixed results when it comes to the duty to consult. According to Anna Baggio, director of conservation planning for environmental non-profit Wildlands League, Cliffs never seemed fully comfortable attempting to operate in the Canadian mining world with its numerous levels of government, strenuous and lengthy permitting processes, and emphasis on aboriginal involvement. “I don’t think they fully understood the First Nations context. I don’t think they understood that they had a responsibility to show due diligence and get a social license,” she tells me. The negotiation process with Matawa’s First Nations is incredibly important, adds Ontario’s Northern Development Minister Michael Gravelle, even if that means slower development. “We all know there is a history of various projects where First Nations have not only not been able to support projects,” he says, “they’ve taken significant measures to oppose them.” When it comes to the the Ring of Fire, Gravelle maintains, the government is taking its duty to consult seriously. Some companies appear to be taking that responsibility seriously, too. Many industry analysts have independently told me Noront, operator of the Eagle’s Nest nickel and copper project in the Ring, has been a “textbook example” of how aboriginal consultations should be run. (Noront CEO Alan Coutts, however, passed on the opportunity to speak with This about their Ring of Fire project and work with local First Nations.) In December 2013, the company released its draft environmental impact statement for its Eagle’s Nest project, covering topics such as: human health and wellbeing, changes to the fabric of First Nations life, and issues regarding substance abuse. The report also detailed how much species-at-risk—such as Woodland Caribou, bald eagles, and Peregrine Falcons—and their habitat will suffer from mine construction. Caribou, a provincially-threatened species, Noront reported, will see an estimated 1,000 hectares of high suitability habitat eliminated as a result of mine construction, plus lose access to a further 100,000 hectares of prime habitat as they try to avoid mine sites and roads. The report also outlines what Noront identifies as numerous socio-economic benefits to the local aboriginal populations in the Ring of Fire, and those across the entirety of northern Ontario through the Ring of Fire Aboriginal Training Alliance, a joint initiative of Matawa, the Kiikenomaga Kikenjigewen Employment Training Services, Noront and Confederation College in Thunder Bay. Such opportunities, the company says, include: the Mikawaa Scholarship program to help local aboriginals continue their education off-reserve (the monetary amount is dependant on application numbers and need); the creation of 780 direct construction jobs and a further 390 operation positions, all paying an average of 60 percent higher than traditional industrial jobs in Ontario; and the potential for tourism and recreation dollars to flow into the community from hunting and fishing expeditions. Noront seems to have realized having access to a trained local workforce will be good for business—not only to tap into a rich vein of workers with regional experience and knowledge, but to gain the social license within the community it needs to operate. The company brought the federal government onboard in August 2013, receiving a $5.9 million investment for the training alliance, noting 196 of the 260 trainees they’ll teach will gain employment with the company later on. Being the furthest along in developing its mine in the Ring, Noront stands the most to gain immediately from whatever revenue sharing, training and environmental guidelines Matawa and the province decide on, a framework that will go a long way toward making sure what companies say they’ll do to help First Nations communities move out of poverty actually gets done. But until the promised benefits arrive, a healthy skepticism is a good thing. Remember, we’ve heard this all before. One way to tell the regional framework Rae and Iacobucci negotiate is worth the time it’s taken to hammer out will be if the promised jobs and community benefits remain long after the mines close. Yet for all the benefits aboriginal communities may get from mining, CAMA’s Matthews continues to recommend First Nations look past the traditional boom-and-bust mining cycle for economic wealth. Too many of mining’s opportunities, he warns, are short-term benefits. “You don’t know how many chiefs have come up to me and said, ‘Four of our band members got laid off [at the local mine],’” Matthews told me. “Being involved in a mining industry is not sustainable for a community.” Industries such as environmental management, on the other hand, can bring long-term social and economic chances—whether a mine is open or not. He has a point: While it’s understandable that many aboriginal communities are desperate for any sort of economic boost, mines are notoriously up-and-down. Eagle’s Nest, which Noront has invested over $150 million in already, is expected to remain operational for 11 years after its anticipated opening date in 2016. The controversial Victor diamond mine near Attawapiskat, after having spent approximately $167 million with aboriginal businesses and joint venture partners, plus more than $1 billion to get the mine operational, employed fewer than 450 workers total at the mine in 2011 to produce 779,000 carats that year. DeBeers expects Victor to have a shelf life of 10-plus years with the possibility of expansion. It is clear Matawa wants to be the exception to Matthews’ rule, perhaps if only because they see no other choice. But as Matawa lead negotiator Bob Rae told a group of reporters in November 2013, “Minerals don’t go stale.” Eventually, the Matawa First Nation Corporation believes, their land will be transformed to wrench mineral wealth from the ground. The goal this time, as Rae points out, is to ensure companies and government’s learn to share power so First Nations don’t lose out when the mining begins. Indeed, Matawa CEO Achneepineskum believes development in the Ring of Fire is inevitable—an outcome he welcomes when his people are satisfied the environmental impacts will be minimal and the economic opportunities abundant. “There is a willingness for a partnership,” he says. “Our people certainly want to be involved.” But, he adds, maybe everyone should take a step back and not let all that resource potential overwhelm them. The Ring of Fire will only proceed so long as there are benefits for everybody, he says, especially the aboriginal people living on the land.